Altamira Fine Art Jackson is pleased to present the latest exhibition from Jackson artist Todd Kosharek. An Artist Reception will be held on Thursday, December 28 from 5:30-7:30pm. Wonderment, meaning a state of awed admiration or respect, penetrates Kosharek’s work and ethos. This new exhibition will be a collection of works exploring themes of peace through ideas of innocence, romanticism (through the works of Romantic era poets and composers), love letters, and illustrations from the past - all things that bring out a sense of wonder to being alive. Todd's signature origami cranes will be the vehicles for the expression of these ideas, with new palettes and techniques explored. Todd Kosharek grew up in rural southern Wisconsin with a supportive family that built him a studio at the age of thirteen. He has been devoted to painting ever since. At the University of Wisconsin/Milwaukee he received a BA in Art History, focusing his attention on late 18th to middle 20th century painting. Through these studies, he learned not only various approaches to technique, color theory, tonality and composition, but also about the importance of art within the fabric of society and how this has changed throughout the ages. This understanding has been an important factor in his choosing of subject matter and his continued exploration of realistic symbolism. Todd continues his study of art history while painting full time in his home studio in Jackson, Wyoming, where he has lived since 2000. He regularly takes portrait commissions and also paints the Wyoming scenery around him. 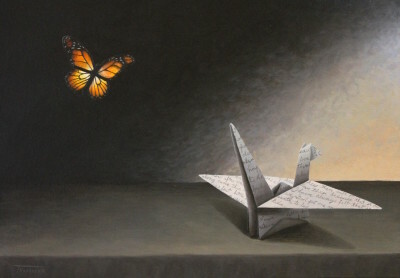 In 2007, he started his series of paintings exploring the symbolic qualities of the origami paper crane for which he is best known. 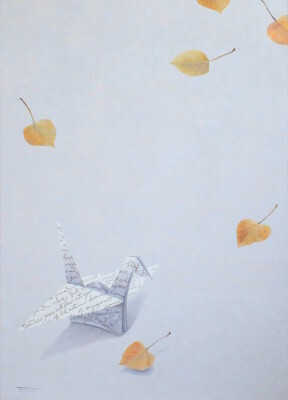 The Origami Crane Series is an on-going collection of interior paintings exploring the ancient Japanese prayer tradition of folding 1,000 cranes. These paintings are contemplations on memory, place, and time. 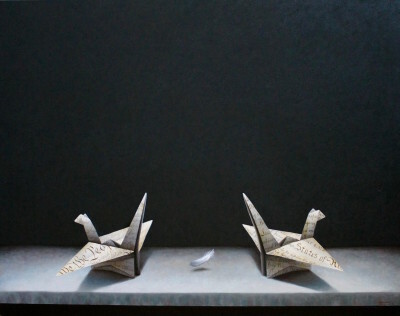 He has also explored the concept of the origami crane as a universally accepted symbol of peace in his ongoing “Project” series. These have included The Peace Project, The Perception Project and The History Project. Todd Kosharek has work in major private and public collections throughout the United States and in Paris, France.